Special Containment Procedures: Outside scheduled experimentation times, SCP-1989 is kept in Storage Containment Unit A-29 at Sector-19. Experimentation may only be performed with prior permission from a member of Level 3 personnel, and the tray must be emptied of all testing materials before returning to storage. Testing of materials altered by SCP-1989 with other SCP objects is to be approved on a case by case basis. 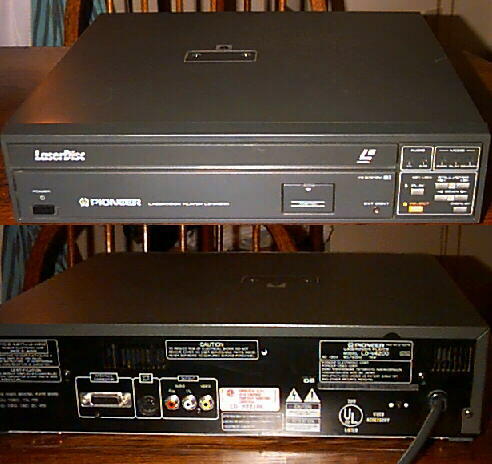 Description: SCP-1989 is a Pioneer LD-V4200 single-sided LaserDisc player, capable of playing both CAV (Standard Play) and CLV (Extended Play) LaserDiscs. SCP-1989 was acquired at the Clemson, South Carolina home of film critic Derwent Masterson III on 05/11/1992 as part of the liquidation of his assets following his suicide; background intelligence and subsequent investigation revealed that the device was a birthday gift (see Addendum 1989-C). Initial inspection revealed internal congruence with other models of the same product line, with one exception: a non-standard disc tray different in shape but not material from the original design. At no point, however, is the narrative broken: characters still present attempt to act out their recorded scenes and delivered lines even though the environment around them has drastically changed; in the event of an outside scene where actors have fallen into the sky, camera angles continue to change as if following unseen events, until the scene changes. Characters and objects in subsequent scenes appear to have recovered from the initial inversion, though the events on-screen continue to be hampered by the change in gravity, and characters who sustain fatal injuries from the inversion or descend into the sky do not reappear for the remainder of playback. Poirot (shouting to be heard over the din): "Excellent, Pierre! And could you summon to me the passengers to me here one by one in this order with the exception of Princess Dragomiroff, who is not only of royal blood but is also much older than she says not to look!" Poirot: "And Pierre, since you are here already, we can conveniently start by questioning you! Your full name is Pierre Paul Michele?" Poirot: "Two male saints' names! You must be greatly blessed!" (Interior shot of SS Poseidon ballroom - ship has capsized, with the majority of passengers on the ballroom's ceiling. A few remain on the floor, clinging to the bolted-down tables and chairs, most of them appearing to be about to let go. Image and gravity inverted. Passengers about to die are suddenly the right way up again; passengers on the ballroom ceiling, including most major characters, fall fifty feet to their deaths. Right-way-up passengers look at each other, bewildered, and appear to feign death - keeling over one by one, in the order that they would have fallen. "…debate about whether film is an art form is nonsense: films are meant to be enjoyed for their exciting content, the thrills of their car chases and the beauty of their actresses… narrative in film is inconsequential. You could turn the finest film topsy-turvy and you won't find one shred of art or entertainment beyond what the writers intend, no narrative imperative: the story is there to entertain, it isn't real." I hope this gives you a change of perspective. Enjoy, my friend. 1. Whether this effect and that observed in SCP-2251 are variations of the same phenomena is currently under investigation.